A young boy leapt at a dog in a corner of the Cathedral of Learning. He massaged its face a little too enthusiastically, and the dog drew back in consternation. The dog’s owner, Marsha Robbins, picked up on her pup’s discomfort and gestured kindly to the boy. “I think he’s done for the day,” she said, guiding the boy toward another dog. The boy went for the dog’s face once more and it turned its back until the boy left. That training characterizes much of Robbins’ work. When students go into the Cathedral to pet one of her therapy dogs every Tuesday and it doesn’t bite or bark, its behavior can seem natural. But it’s really the product of a rigorous 30-week training program that Robbins, a 70-year-old former special education teacher, developed from scratch over the past decade. It includes a 90-minute certification test, diversity training and environmental conditioning specific to Oakland. Robbins’ program consists of five six-week periods and has trained over 350 therapy dogs in the past 16 years. These dogs service several local universities, hospitals and nursing homes. Her program focuses on teaching humans to understand their dogs. She teaches canines to express their discomfort to their humans, and she teaches the owners to pick up on those cues. “These guys are learning to read the sentences the dogs are giving them,” Robbins said. During a July training class, while someone walked around the room with a stuffed dog in their purse, Robbins revealed a little-known fact — dogs are often afraid of people holding babies or other dogs. “They think it’s a human with two heads,” Robbins said. A terrier named Fallon barked at the volunteer with the stuffed animal. “That’s him saying ‘What is going on? Make it stop!’” Robbins told the class, laughing. Owners’ desire to share their dogs’ capacities for unqualified acceptance inspires most of the people who attend the trainings. Arleen Salerno, 63, from Sharpsburg, was motivated by news of student suicides to train her 23-month-old golden retriever Polly as a therapy dog. “I want to show people that dogs are dogs, and that it doesn’t matter who you are — they’ll still love you,” Salerno said. Robbins’ path to leading the Pitt therapy dogs program began in 1988 when she came to Pitt to pursue a master’s degree in education. While attending an educational psychology class, she discovered that the University fed the lab rats used for behavioral experiments to snakes after the course ended. Feeling sorry for the rats, Robbins smuggled one back to her kindergarten class at Pioneer Valley, where she taught children with special needs. One day, Robbins was startled when a boy with elective mutism — a condition where a child refuses to speak in any social situation — asked the rat if it wanted more food. After that, the boy began to talk to the rat every day. It was a short step from the rat to fellow classmates and finally to his teachers. “The animal helped him interact with the world,” Robbins said. Robbins noticed animals helping other children during her years teaching, including a 13-year-old non-verbal student with severe autism she taught in 1995. She started bringing him with her to the Western Pennsylvania Humane Society, which is now called Humane Animal Rescue. The boy was reluctant to interact with the animals, until one day someone brought in a mutt named Simba. Robbins and a few employees showed the boy how to interact with Simba, and the two became friends. Robbins took pictures of the pair playing and posted them to Simba’s crate. A family saw the pictures and adopted Simba shortly afterward. Robbins saw an opportunity to help both the children and the animals and began bringing more children with special needs to the shelter. With the help of a grant from the Milken Family Foundation, she began taking students to the shelter to play and encourage people to adopt dogs. Robbins then took the therapy aspect into her own hands when she got her first therapy dog, a great Dane-black lab mix named Moses, from Humane Animal Rescue in 1999. She took him through the training process and he passed the Therapy Dog International test in 2000 on his first try. The pair went to work shortly afterwards, visiting schools where she taught, nursing homes and hospitals. Then Robbins remembered how much her Pitt classmates in the late ’80s talked about missing their dogs, so she started bringing Moses to the campus in 2002. At first, Pitt wouldn’t let her in buildings due to liability issues, but she was persistent. With the help of campus student leaders, Robbins discovered she and Moses could enter campus buildings if a student organized the visit. She scoped out a spot in the Cathedral and got to work. Over the next 16 years, Robbins was sponsored by the Students for a Multicultural Tomorrow, the Pitt Psychology Club and, eventually, Pitt’s Office of Residence Life. In the meantime, she developed her training program for therapy dogs in anticipation of creating a program between the Pioneer Valley Special Education System and Humane Animal Rescue. Pioneer Valley’s new principal scrapped the new program when Robbins retired from teaching in 2005. According to Robbins, he thought dogs couldn’t be trusted around children with special needs. “It was heartbreaking. But you just pack up and keep on moving,” Robbins said. 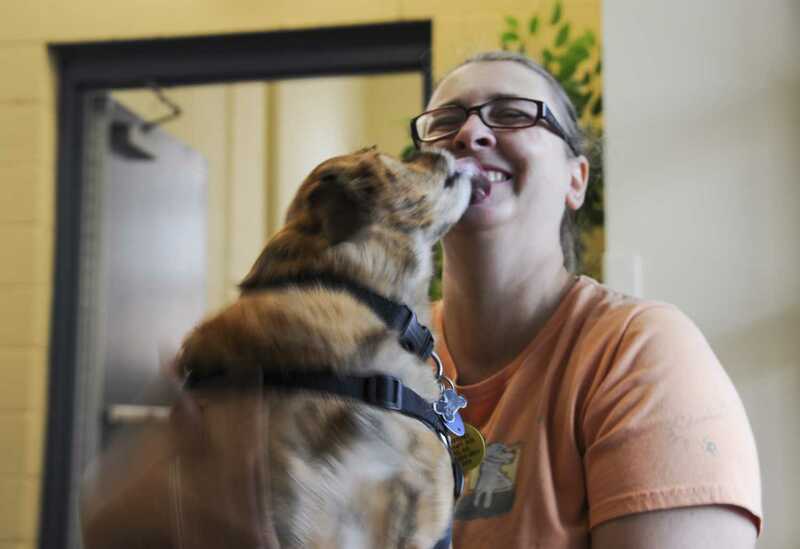 She instead threw herself into her therapy dog training at Humane Animal Rescue, working on expanding her reach at Pitt and making friends with regular attendees. Eli Ream, a senior chemical engineering major, manages the Snapchat account for Therapy Dog Tuesdays. They started going to Therapy Dog Tuesdays their sophomore year after their dog passed away, where they connected with Robbins’ dog Presto. While the community around the dogs has grown together, the dogs are still the main attraction. Robbins’ therapy dogs have fostered a community of acceptance for anybody who needs their help.